Sometime we need a complete development environment to compile, deploy and test our solutions, and sometimes we can't play directly on the hardware, or, simply, the provided SDK is not enough for our development plans. This could be, for example, the case of Intel Edison or Galileo: how can I compile entire frameworks, runtimes and their dependencies on Yocto Linux OS? 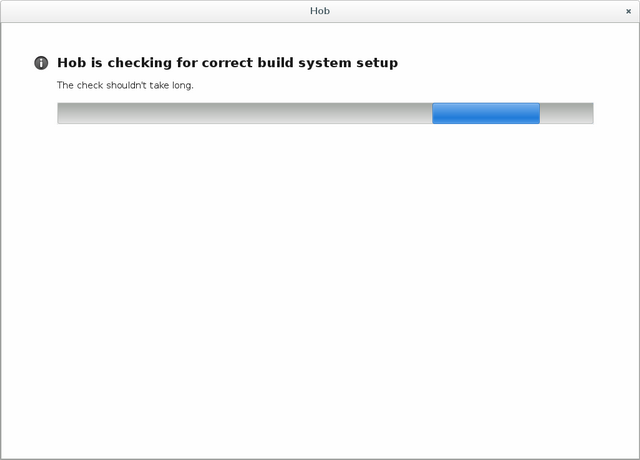 Note 1: the success of the previous command depends on the version of the Ubuntu/Debian you are using. 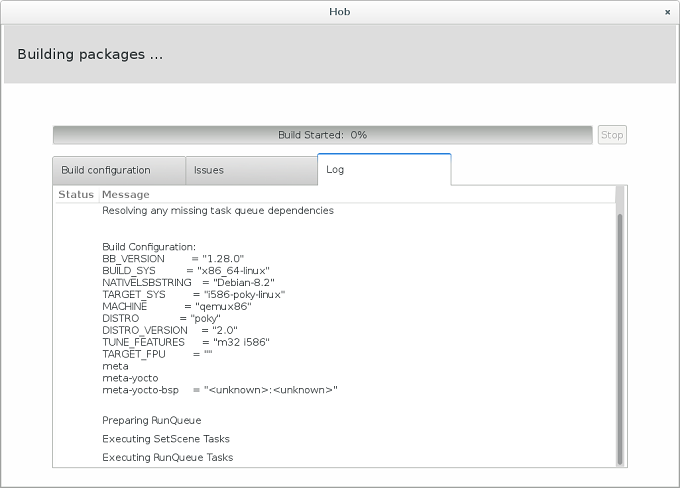 Eventually, to resolve dependencies of packages you can run "aptitude" and force the installation of the right version of packages you need (for example, "aptitude install libsdl1.2-dev"). Note 2: for other Linux-distribution, like RadHat, CentOS, Fedora, SuSe, Gentoo, etc… I suggest to check the respective versions of the previous package using the correct package-manager (for example, zypper, yum, …). 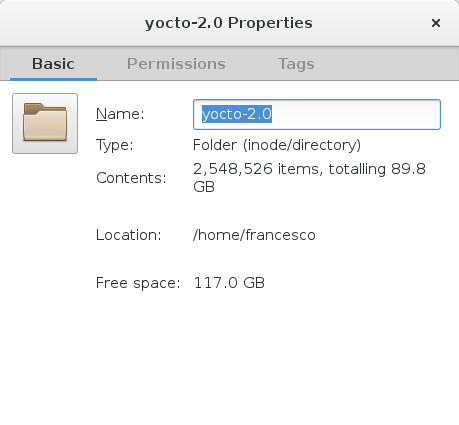 Note 3: you can choose other development branch of Yocto releases following this link https://www.yoctoproject.org/downloads. 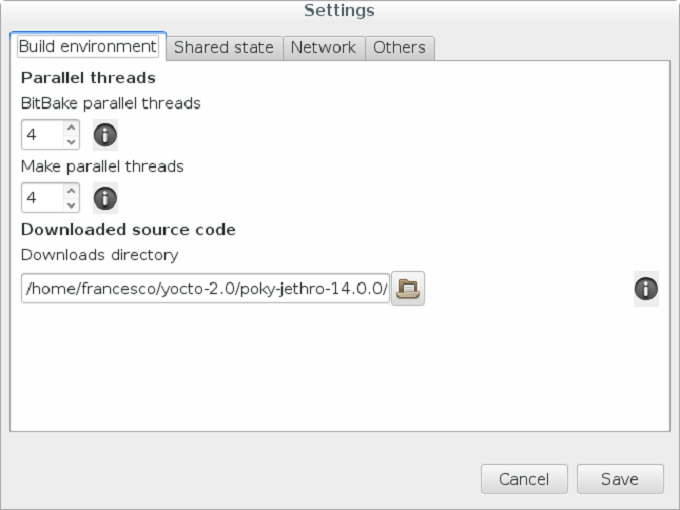 In this tutorial will use the current latest release "Jocto Poky 2.0.14.0.0 codename Jethro". There is a very easy-to-use script provided by Yocto developers. After you run the script, if it worked, your location will be changed to a build subdirectory that will be your new workspace. Something like /home/<your user>/yocto-2.0/poky-jethro-14.0.0/build/. Executing the previous script a conf/local.conf file was created. 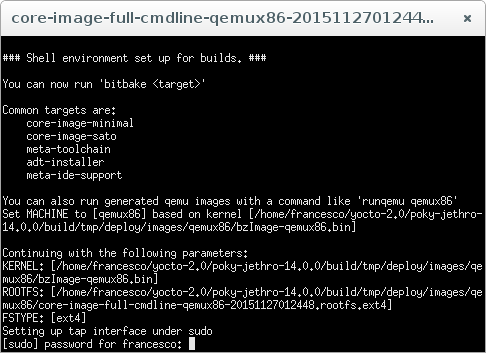 The configuration file needs to set up bitbake, the build engine of Yocto (core component of the Yocto Project). I suggest to build all the available extra features to the image. The resulting images will be heavy (around 8GB each), but absolutely complete and absolutely versatile for every need of development. EXTRA_IMAGE_FEATURES = "dbg-pkgs dev-pkgs ptest-pkgs tools-sdk tools-debug eclipse-debug tools-profile tools-testapps debug-tweaks"
Now, save the changes made to the file local.conf with CTRL+X keyboard combination. 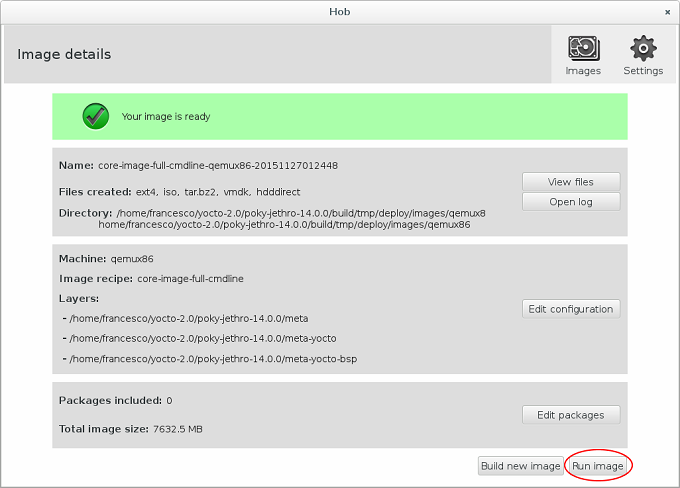 Now an instance of Hob (the GTK2-based graphical user interface for BitBake) should start, checking for the correctness of build system. Now select qemux86 as machine in the dropdown menu. 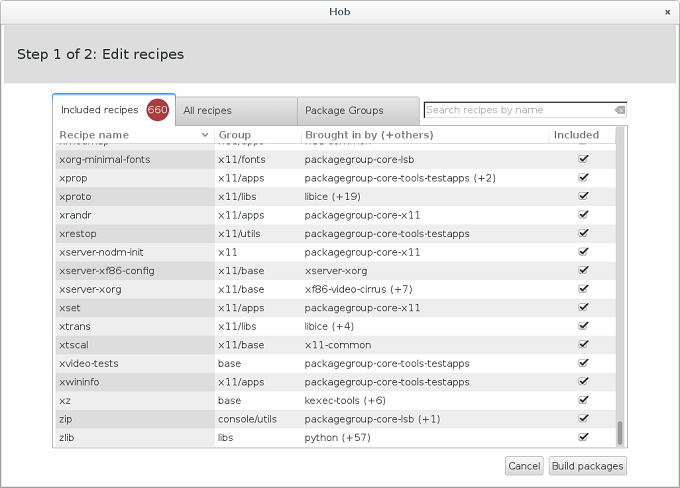 Wait until Hob will finish parsing BitBake recipes and generating dependency tree. 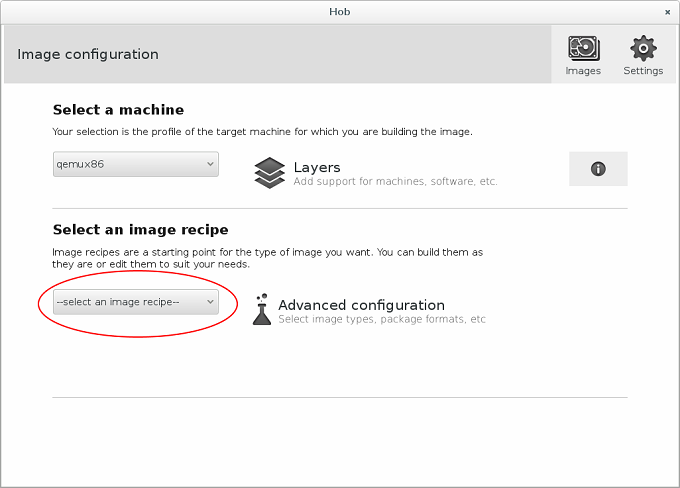 Then, select your preferred target image to build from the "select an image recipe" from the menu above. 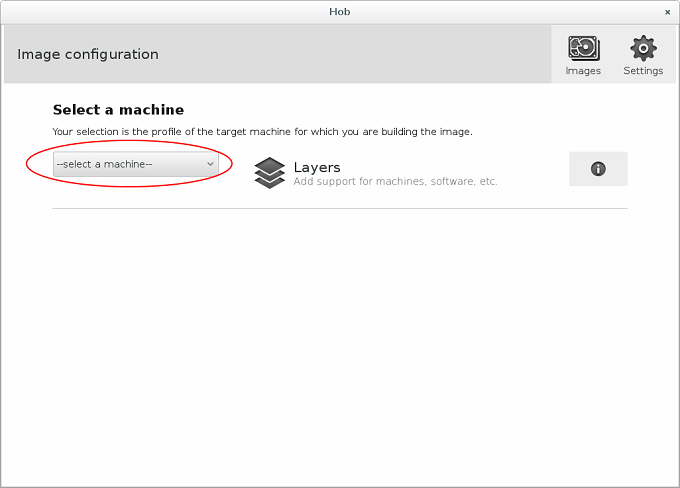 In this sample we'll select the full core image without the GUI: core-image-full-cmdline. Now click on "Advanced Configuration". 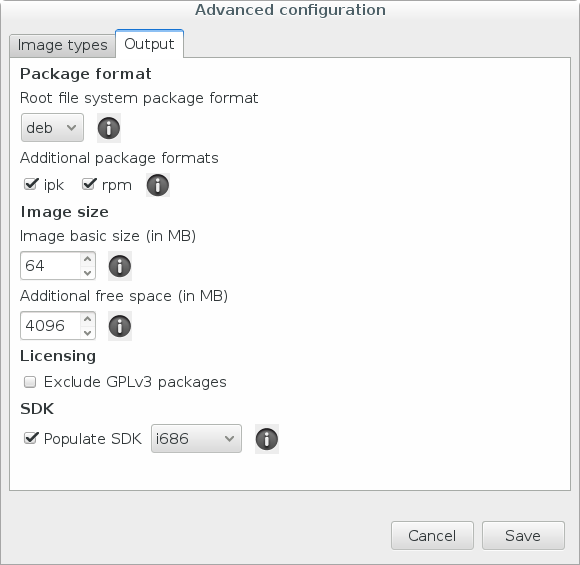 In "Image types" panel leave poky in the "Distro" menu if you want to build the latest stable release. 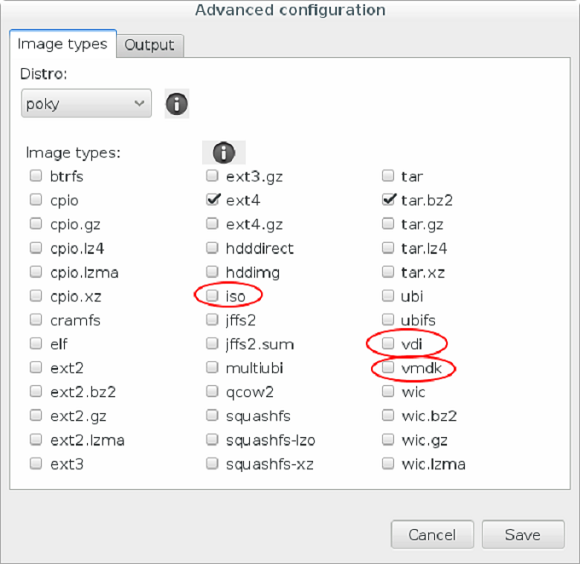 Then in "Image types" field select the format you need: usually, I select ".iso", ".vdi" and ".vmdk", they are the most useful and comfortable formats. Ok, save. Now, you are ready to build your image! Click on "Build image" button! 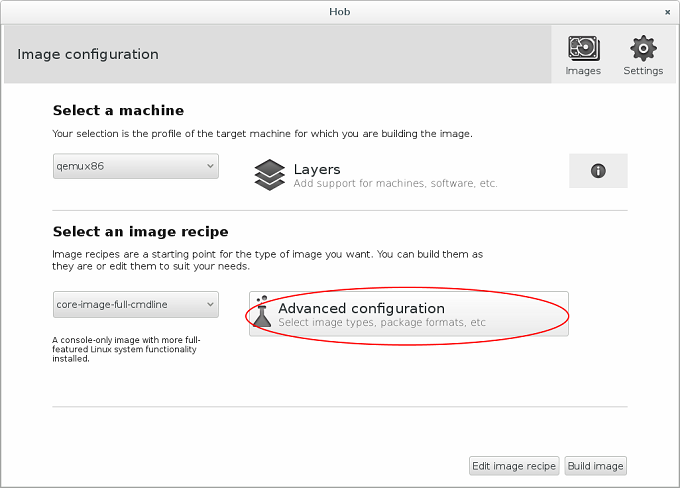 Hob will launch for you an instance of bitbake core-image-full-cmdline with your favorite settings. Note 8: finally, with Hob you have the opportunity to decide what packages you want to include inside the image you are going to build. 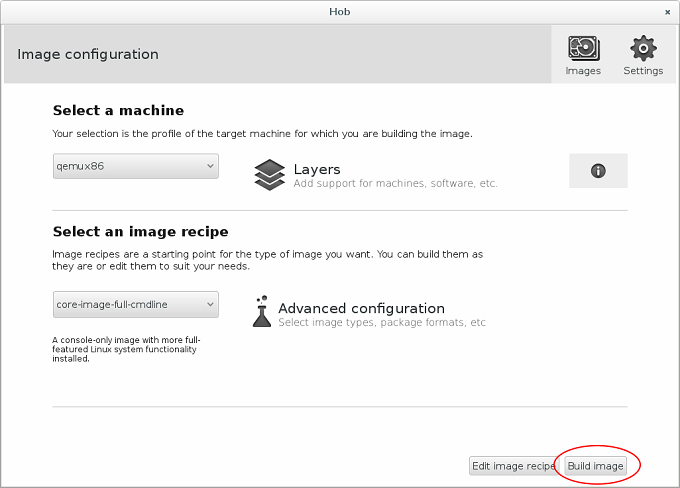 To do that before start building the image, you can select "Edit image recipe". Now, when the building process will end, you’ll be able to directly try out your new generated images! Clicking on "Run image" Hob will launch for you an instance of QEMU to run the newly created qemux86 image. Another UNIX command line console window will open to show the loading state and the splashscreen of Yocto Project OS. You are now ready to log into the root account of your newly created Yocto image. Remember: inserting debug-tweaks parameter in EXTRA_IMAGE_FEATURES variable onto the conf/local.conf you’ll be able to login as root leaving the password field empty. Otherwise, you’ll need to set up root password in the recipe before building the image. 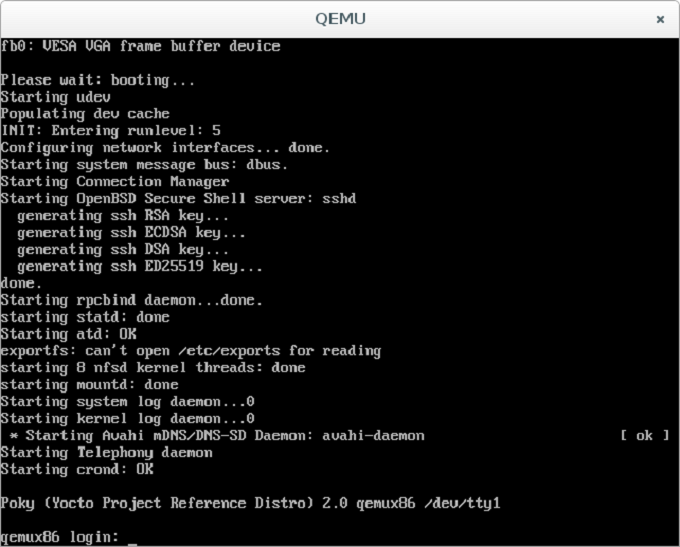 You are now ready to star playing with the Yocto QEMU virtual machine. Note 9: after built the Yocto image as presented in this tutorial, 89.8GBs of free space were occupied on the drive. You will can find the generated images in the .iso, .vmdk, .vdi and the other formats you choose inside the directory ~/yocto-2.0/poky-jethro-14.0.0/build/tmp/deploy/images/qemux86/*. Now, you are free to load the images inside your preferred hypervisor or emulator (Microsoft* Hyper-V, vmWare Fusion, Virtualbox, etc…).